Magic is all around us The magic of technology is universal – allowing us to do wondrous things. It can put us in two places at once. Help save a life. Breathe life into machines. Fuelled by imagination, the magic of technology creates infinite possibilities, helping every one of us to truly thrive. What if you could…? That’s what our engineers, innovators, service staff and advisors ask themselves whenever they’re faced with a problem. When your favourite devices didn’t work in Australian conditions, we helped make it possible. When you wanted to take your home broadband data with you, we built Australia’s largest Wi-Fi network. Why? Because we don’t settle for ‘good enough’. What if you could feel at home, half a world away? What if your office could let you work on the go? What if you could make guests feel at home when you’re not? When you’re on the other side of the world, it’s nice to hear a familiar voice or see a friendly face. The Telstra Air Network® lets Telstra Air members use their home broadband data allowance at thousands of hotspots across Australia and millions around the world. So you can Skype, stream and get connected to home, even when you’re far away. Running a successful business means being in three places at once. Digital Office Technology™ lets you do what you need to do, when you’re on the go. It’s an all-in-one mobile, landline and broadband solution that helps you to manage orders, share data across locations and set up simultaneous ringing. So you can get in touch with business, when you’re away from your business. You can’t always be there to welcome your guests, but what if your home could? A Telstra Smart Home™ will make life easy. It will let you unlock doors remotely for guests, tradespeople or deliveries, light the house up as you walk in and magically turn things off when you leave. It will even be able to tell you when the kids are home, so you can feel close when you’re far away. What if our superhighway had a priority lane for our superheroes? In a land prone to bushfire, drought and flooding, our emergency services do a superhuman job. Telstra is developing a world-class solution to give them data priority access on our LTE network. So the people we depend upon have a network they can depend on. What if your idea could grow into a movement? Telstra is helping Australia uncover the precious resources that will power our future: ideas. We’re helping entrepreneurs around Australia realise their dreams. Our muru-D start up accelerator and Gurrowa Innovation Lab bring together entrepreneurs, mentors, industry leaders and investors. They foster a culture of innovation that helps ideas flourish and grow, and Australia to thrive. What if your seat was always the best seat in the house? Not missing half the match in the drinks queue. At a Telstra Smart Venue your sporting experience is enhanced and streamlined. Get access to traffic updates, social connecting, free Wi-Fi and pre-order half-time snacks and drinks from your seat. It’s a win-win, even if you’re losing. What if you could turn your living room into a waiting room? Sickness doesn’t keep business hours. That’s when Telstra ReadyCare can help. It provides 24/7 access to an experienced, Australian-based GP who is able to talk to you and your family over the phone or by video to provide advice, diagnosis, treatment or prescriptions for a wide range of conditions. What if you could set up in Asia faster than flying there? New markets open up a world of opportunities for your business. To grasp them, you need to move quickly. Telstra Cloud Services puts flexibility and scalability at your fingertips. Your business data is nimble, ready to move with you at a moment’s notice. While your applications and business processes can run securely, and can go regional in no time. Making setting up in Asia is as simple as opening a laptop. What if we could help artists truly fly? We’ve been a long-time supporter of helping Australians connect to the things they love. Our partnerships cover everything from sport to the visual arts. But it’s our 32-year partnership with The Australian Ballet that has been nothing short of a choreographer’s dream. A true strategic partnership that leverage’s Telstra’s scale, technology and marketing capabilities and The Australian Ballet’s artistic excellence to bring this transformative art form to new audiences year after year after year. Technology offers us magic of a different kind. The type you can hold in the palm of your hand, that keeps your loved ones close, and your world more connected than ever before. Be free to share and laugh, stay in touch with your passions, with people, with nothing in particular or infinite possibilities. We’ve built Australia’s best mobile network, Australia’s largest Wi-Fi network and Australia’s most trusted broadband network. Think of them as there to help you thrive. What makes our mobile network better? What makes our Wi-Fi network better? What makes being connected at home better? We have Australia’s fastest mobile network, based on national average combined 3G/4G speeds. So you can stream, upload or download, or just unload. We’ve brought 4G coverage to more places in Australia than any other provider. So more townships that couldn’t communicate, do business or enjoy Game of Thrones on 4G now have access to the Telstra mobile network. Plus, we have the largest mobile network coverage of any carrier reaching 99.3% of the population and 2.4M sq. km. of the country – that’s hundreds of thousands of sq. km. more coverage than our nearest competitor. We have delivered Australia’s first Voice capability on 4G, allowing faster call connection times and faster browsing while also on a voice call. Plus, we were the world’s first to launch commercial services supporting data up to 600Mbps speeds (Cat 11 devices in selected capital city CBDs for peak speeds, typical speeds will be lower) and the world’s first to demonstrate speeds up to 1Gbps speeds on a live mobile network. We have the lowest call dropout rate of any Network in Australia. And, with coverage in more buildings across Australia you’ll also get fewer dead-spots. Telstra Air is Australia’s largest Wi-Fi network, with over 400,000 hotspots across Australia. 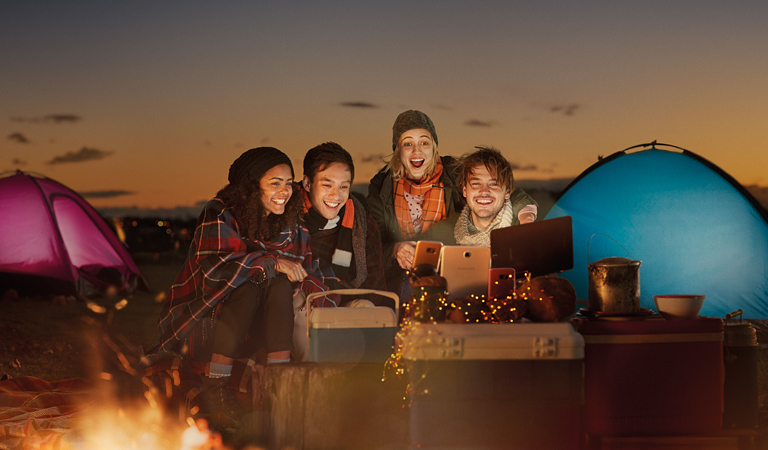 Eligible mobile and broadband customers can now access Wi-Fi wherever they’re in range of a Telstra Air hotspot. So you can get some Air, while you get some fresh air. When you’re with us, you can feel close even when you’re far away. That’s because Telstra Air members can use their home broadband data allowance at millions of hotspots in selected countries. So you can Skype, stream and get connected when you’re away from home. The nbn™ network is Australia’s landline phone and internet network. As an nbn network retail service provider, we can assist your transition and arrange your nbn appointment. And with our range of bundles, you can also add an entertainment package to bring your home to life. Our home broadband is fast, reliable and affordable. There’s even 24x7 Support to help keep you connected. And when it comes to our bundles, they’re designed with you in mind. Choose from full entertainment packages, to basic home phone and broadband options. When you’re with us, you’re not on your own. Our Telstra Platinum service provides 24x7 Support for most gadgets, computers and your internet. While Telstra Broadband Protect helps to protect every device connected to your Telstra home broadband service. news, insights and opinions around the way you use technology. Telstra Air: Eligible Telstra home broadband service and compatible gateway required to become a Telstra Air member. For Telstra Air members, all Telstra Air usage will count towards your home broadband allowance, including usage that is unmetered when accessed at home. All Telstra Air usage will count toward your home broadband allowance, including usage that is unmetered when accessed at home.